Nooooooo!!!!! 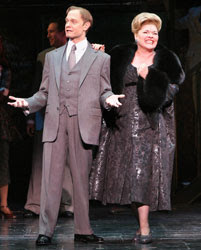 It has just been announced that Curtains, the murder mystery musical at the Hirschfeld Theatre, will play it's last performance on June 29, 2008. At the time of closing they would have played 511 performances and 26 previews. Didn't they just announce that the whole principal cast extended their contracts until the end of August? And the show just celebrated their 1 year anniversary on Feb 27 (previews)? I guess, to use one of the lines of the show.....It's a business.........I'm really sad that it's closing because it's a really enjoyable show and the cast is amazing and seems to enjoy being onstage together. I would love to see it again. Funny that the closing date June 29 is exactly a year after I saw the show! I know how you feel. This was the first musical I saw on Broadway, last April, and I loved it. It was so much fun, the characters were great, I loved David Hyde Pierce and Debra Monk. I had such a great time, and then I met the cast at the stage door afterward and they were wonderful. I'm sorry it won't have a longer run.